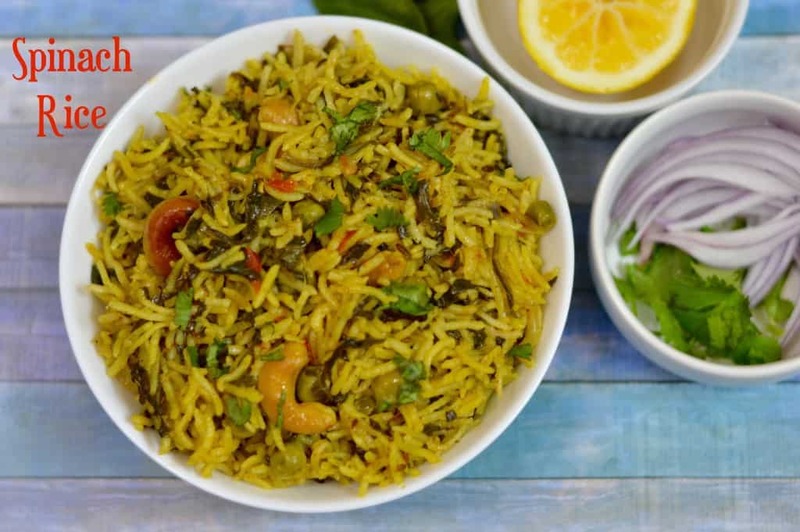 Palak Pulao is a quick and healthy filled with greens, beans and carbohydrates all-in-one pot . It is healthy and full of proteins, fibers and vitamins and perfect for lunch boxes, that your kids and your family would love to have it. Press saute mode on Instant Pot. Add oil and once it's hot, add whole spices, cumin and cashew-nuts. Saute till cashew nuts turn light brown in color. Then add sliced onions,ginger-garlic paste,green chillies .Saute for 2-3 minutes until they turn soft and light brown in color - stir regularly. Then add tomatoes.cook for 2 minutes till they turn soft. Add spinach leaves,green peas cook till the leaves wilt. 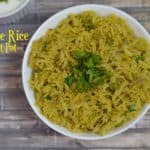 Add rinsed Basmati Rice,water,turmeric powder,garam masala powder,coriander powder,coriander leaves,lime juice and give a stir . Spinach Rice is ready.Serve with Raita or plain yogurt. Heat a pressure cooker with oil on medium flame, Add oil and once it's hot, add whole spices, cumin and cashew-nuts. Close the lid place a whistle and cook for 2 whistles on medium flame. After 10 mins Fluff up the rice gently. 1.You can add some veggies like carrot, beans to this as well. 2.You can add ghee instead of oil to make it more flavorful. Grind/Blend together green chillies,ginger,garlic,cinnamon,cardamom together to a coarse paste.Keep aside. Press SAUTE mode on Instant Pot. Add oil in to the POT. Once POT is hot add in the cumin/jeera.Then add blended mixture and Saute for 15 secs.Note: the mixture can stick or burn to the bottom so stir continuously. Then add in the onions and Saute until onions turn light brown in color. Now add in the chopped cabbage,green peas,turmeric powder ,mix well and saute for 30 secs. Add rice,water,salt and garam masala and give a quick stir. Do a QUICK RELEASE(QR) OR if you have time wait for NATURAL PRESSURE RELEASE(NPR)(Wait until silver button on lid drops).BE CAREFUL OF THE HOT STEAM. Once the pressure has released, open the lid. Add juice of half lemon and garnish with cilantro/coriander leaves and mix well. 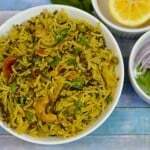 Cabbage Rice or Cabbage pulao is ready, serve with yogurt,raita. Heat oil in a pressure cooker and add in the cumin/jeera.Then add blended mixture and Saute for 15 secs.Note: the mixture can stick or burn to the bottom so stir continuously. Close the lid and put the whistle weight on. Cook for 2 whistles on medium flame and turn off the gas. 1.You can also add 2 tablespoon of shredded coconut(fresh or frozen) while grinding,gives an extra flavour.But its optional if you dont have it.